For visitors to Capetown in South Africa, one of the things well worth seeing is the Kirstenbosch Gardens at the foot of Table Mountain. The gardens, and the adjoining nature reserve, have a colourful history (see foot of this page) and support a wide variety of indigenous animals, reptiles, frogs and invertebrates. 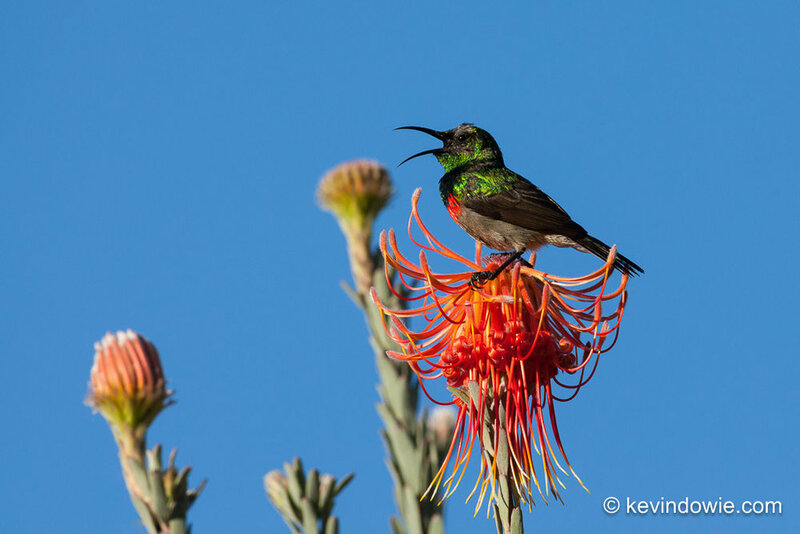 More than 125 species of birds have been recorded at Kirstenbosch from Flycatchers to Eagle Owls but it was the prospect of seeing and photographing the exquisite Sunbirds that drew me there. There are 132 species of sunbirds, and their close relatives spiderhunters, found from Africa through Southern Asia and into Northern Australia. They feed largely on nectar but will also take insects and spiders. In an example of convergent evolution, they have many characteristics associated with the hummingbirds of the Americas and honey-eaters of Australia. The curved bill is an adaption to nectar feeding on flowers and some species will hover, hummingbird like whilst feeding. 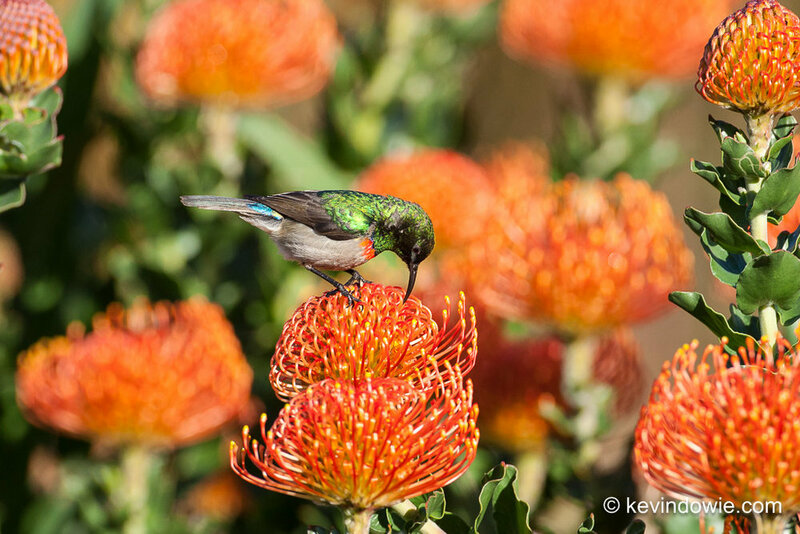 The species which I got to observe was the Southern double-collared sunbird, Cinnyris chalybeus, which were attracted to a veritable banquet of proteas! Kirstenbosch National Gardens at the foot of Table Mountain on the outskirts of Capetown, South Africa. A beautiful Southern Double-Collared Sunbird, perches on a shrub, Kirstenbosch Gardens, Capetown. Southern Double-Collared Sunbird, preening, Kirstenbosch. 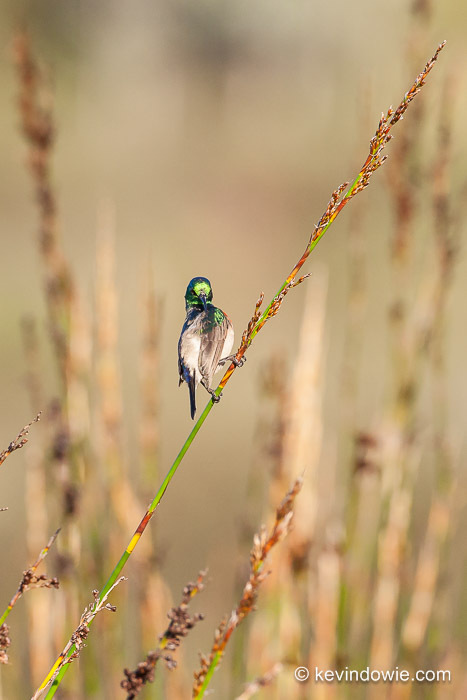 Southern Double-Collared Sunbird, perched on grass head, Kirstenbosch. Female Southern Double-Collared Sunbird, Kirstenbosch. 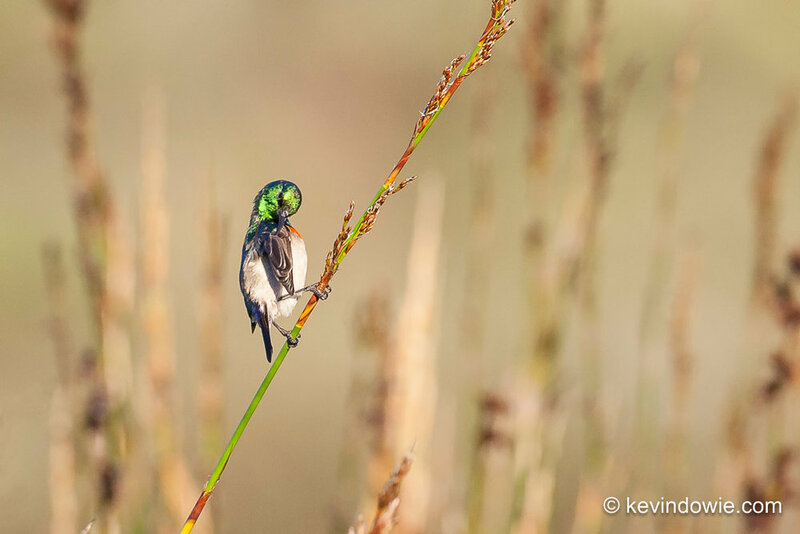 As is the case with many bird species, the female is fairly drab in appearance compared to the colourful male. Female Southern Double-Collared Sunbird on seed head, Kirstenbosch. Southern Double-Collared Sunbird calling, Kirstenbosch. Southern Double-Collared Sunbird on Protea, Kirstenbosch. Southern Double-Collared Sunbird feeding on Protea. Female Southern Double-Collared Sunbird on Protea, Kirstenbosch. 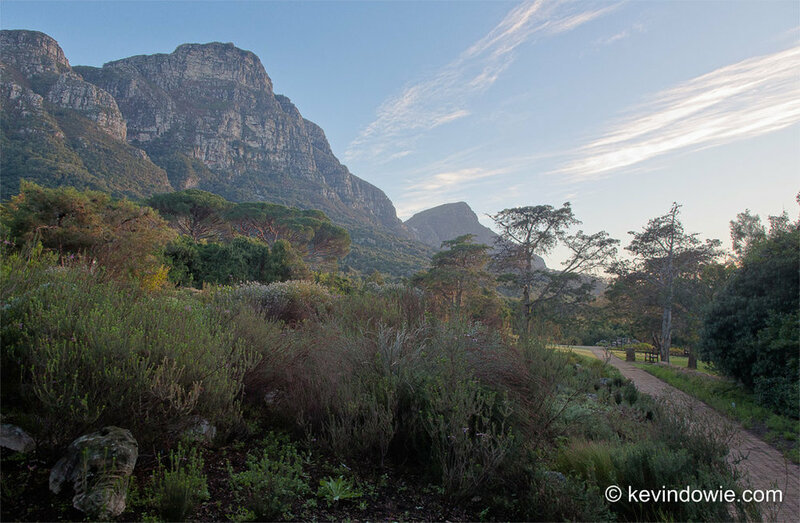 Kirstenbosch National Botanical Garden, to give it it's full title, is widely regarded as one of the finest gardens in Africa and indeed one of the great botanic gardens of the world. Established in 1913, the garden covers 36 hectares with the remainder of the 528 hectare estate being maintained as a nature reserve supporting natural forest and a variety of animal species. The garden and accompanying reserve are part of the Cape Floristic Region and in 2004 was declared a UNESCO World Heritage Site, making it the first botanic garden in the world to be included within a natural World Heritage Site. Prior to its development as a garden, the area had a long and colourful history of human interaction dating back tens of thousands of years as evidenced by Stone Age hand-axes and stone implements which have been unearthed there. Europeans first sailed around the Cape of Good Hope in the late 15th Century, by which time the Khoikhoi people had been grazing cattle in the area for about 2000 years. By the mid 17th Century the Dutch East India Company had set up a "refreshment station for passing ships" on the Cape with the settlement soon extending to the Kirstenbosch area and bringing the settlers into direct conflict with the native Khoikhoi. During 1659-60 the settlers built a defensive barrier of wooden fences, watch towers and thorny hedges to protect the settlement. Parts of Van Riebeeck's Hedge are still visible in Kirstenbosch today. In 1895 Cecil Rhodes purchased Kirstenbosch, appointed a caretaker, and planted an avenue of Camphor trees and Moreton Bay Figs. Unfortunately it appears that Cecil devoted most of his energies to the exploitation of Southern Africa's people and resources with the result that the land was neglected, became rundown, and overrun by feral pigs. Following Rhodes death in 1902, the land was bequeathed to the Government and administered by the Forestry Department falling further into neglect until the establishment of the gardens under the direction of botanist Henry Pearson. Pearson did more than anyone to create the gardens as they now exist and there is a memorial to him within the grounds.